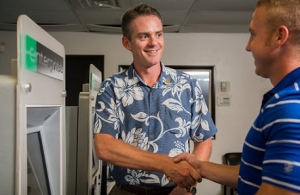 Excellent customer service is in full bloom at Enterprise branches all across the Hawaiian islands these days—and it’s no accident. Customer satisfaction scores are now consistently hitting the corporate average (and nudging even higher) as the result of a high-profile effort to reach 100 percent customer satisfaction. An eye-catching pin, with “100%” emblazoned atop a golden hibiscus bloom, has become the official symbol of the Hawaii Group’s commitment to outstanding service. Worn by every customer-facing member of the team, the pin serves as a reminder to “deliver the best service we can, 100 percent of the time,” says Dan S., Vice President/General Manager. It wasn’t so long ago that customer satisfaction was a sore spot for the group. As recently as 2013, Hawaii’s scores were below our company’s average. “Since we were well under par, we dissected things pretty thoroughly to figure out what we were missing,” says Jeff H., Group Rental Manager. The little things really do matter, agrees Charlie R., Area Rental Manager on Oahu. He noticed that scores improved whenever his team took extra steps, like making follow-up customer calls. That’s the key to great service: “It’s got to be simple, so every branch can do it,” Charlie says. Putting this approach into action last year, Charlie worked with a colleague to develop a five-step improvement plan that has since been adopted across Hawaii. All five steps draw on proven customer service tools and best practices, but there’s a definite Hawaiian flair to the program, too. Making the “Aloha spirit” the first thing that happens at every touch point is incredibly effective, according to Jeff. Considering the fact that most visitors have just stepped off a 6- or 7-hour plane ride, the pleasant greeting certainly helps get conversations off on the right foot. It’s also an important part of Hawaiian culture, notes Mark W., Area Manager – Honolulu Airport. Last year, the Hawaii Group provided special training for airport and management employees to immerse them more deeply in the state’s tradition of Ho`okipa hospitality.